I’ve been climbing with Martins guidance for almost 20 years and was delighted when he agreed to lead me across the ridge. The weather forecast looked good, so I drove the 500 miles north from Derbyshire and spent a restful night on the mainland, before Martin and I headed for Skye. We left shore at the stunning village of Elgol aboard the ‘Misty Isle’ and headed towards, what in my view, is one of the most beautiful places on this earth – Loch Coruisk. I hadn’t journeyed this way since before I had suffered frostbite. The seas were clear and the tourists on the boat enjoyed the seals and their pups basking on the rocks. After a cuppa and cake we headed out and began our journey. My injuries force me to climb and scramble in B3 mountaineering boots. They are the only footwear to give me good ankle support and have the strength to edge on good footholds. The Dubhs Ridge is a long set of ascending slabs which gives an excellent start to the route and I basically ran up them on all fours. The B3’s may be useful, but the can force your weight backwards, so I leant hard forwards..! Every time I head into the mountains, I’m on a learning mission. I looked at the slabs, found the best way for me to climb them and set off. The rock was sharp and quickly began to wear at my skin grafts. They started to become sore, but I felt little issue with this. I was about to find that two days on the Cullin would almost wear them out. After a short break at Sgurr Dubh Beag, we ascended Sgurr Dubh Mor and approached the TD Gap. A few walkers had been wandering up the Stone Chute and they looked on as we abseiled into this legendary break in the ridge and then climbed out. Martin led, dragging the water laden bags on a rope afterwards, before I followed. I could wedge my big boots into the rock and managed to reach sufficient hand holds to drag myself up. I can’t describe what sensations go through my fingers when rock climbing as a deal of the nerves have been permanently damaged. Sometimes I can feel what I’m holding, sometimes I cant. Trust is my friend, but with fat fingers, only the largest hand holds will do. I was thankful that there was little wind and that we crossed the gap without huge effort. A few drops of rain fell, but as the evening fell a warming glow filled the skies. 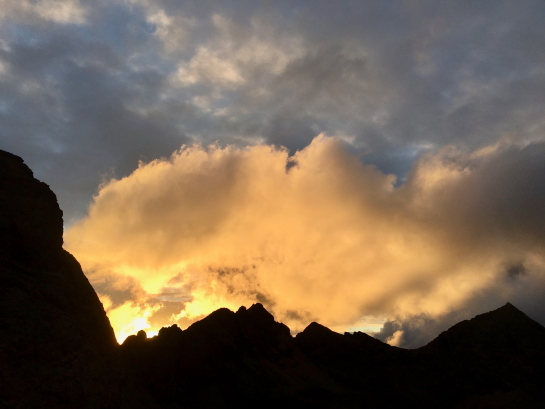 We had decided to bivouac on Bealach Coire Lagan and as we lay in our sleeping bags, the Cuillin lit up around us. Moments like this are what make the mountains so special to me. Clear air, fiery skies, good company and wee dram made the evening. I had taken my boots off earlier to air my aching feet, and spent important time maintaining the skin grafts. I must clean and cream them at least twice a day, otherwise a throbbing pain fills my nerves. Plenty of spare socks were the only indulgence in my rucksack. I felt a brief shower in the night, but otherwise slept well and rose to another clear morning. The In Pinn was only a few minutes away and after a good breakfast, we set off to traverse this legendary summit. There was hardly a soul in sight as we abseiled off the back and then crossed Banachdich, Ghreadaidh and Mhadaidh. I felt string, but soreness was beginning to affect both my hands and feet. The beautiful scenery and sunshine kept me going, as did the huge slab of Chocolate Brownie my friend Rebecca had baked for us. It went down wonderfully with a Jetboil blasted afternoon coffee. As the evening approached, a stiffening northerly breeze began to rise and with it a thickening cloud followed. We thought of spending the night on the summit of Bruach na Frithe, but the wind was buffeting at best and we sought shelter off the ridge. It was late evening and Martin and I tried to shelter under the Bhasteir Tooth in the hope of finding a spot for the night. There was nothing to be seen. I fired up the Jetboil, made tea and food, before we decided to push on until the ridge end. I was concerned about climbing in the failing light, but Martin though that completing the ridge would be the best option. He was right. Naismith’s Route on the Tooth was fully shaded from the wind and Martin led it with great skill. I scuttled up behind him to find that even he had felt exposed on the climb, due to a piece having fallen away from the crux some time back. I scuttled up behind him, glad that the cloud and approaching darkness shielded me from some of the exposure. By now my hands were red and a touch of blood was coming from my finger tips, but onward we pushed. We summited Sgurr nan Gillean shortly after 10pm, but our celebration was brief. The wind was increasing and the last of the daylight was departing the sky. We abseiled off and headed down into the scree laden Coire a’Bhasteir. I find rock screes hard work these days and only night vision, and later the piercing beam of my head torch helped the descent. At exactly 11:58pm we lay down our bags, brewed a well-earned cup of tea and settled down for the night. The wind was gone and we had soft grass on which to lay. It was a luxury we couldn’t have enjoyed on the ridge. We didn’t stir until 6am, and were greeted by a clouded ridge, but blue skies around. There is something magical about moments like this. The work is done, you can see what you have achieved and the wander home is a simple and relaxed one. I had finally completed the Cuillin Ridge, although Martin’s 40 crossings rather put me to shame..! I’m not a man who feels emotion quickly, nor do I share it well. Only now as I sit at home can I truly comprehend what I learned on the traverse and continue to understand how my injuries work. Skin is still peeling from my hands and my feet feel tired, but the work is done, well, until the next adventure..! Brilliant Nigel, I admire your determination at the ripe old age of 28! !